This weekend while I was getting ready to step into the shower I caught a glimpse of myself from the backside. I stopped to check myself out from the point of view I rarely see. I moved a mirror to take it all in. I have an enormous bald spot, love handles flank my midsection, and I have a jiggly bottom. 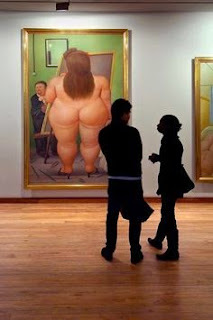 I felt like a male muse for a Fernando Botero painting. It was a funny moment. This is so sweet. . . . And as for you, I think you need glasses. Either that or when you put on your clothes you all the things you mentioned just disappear. And I meant YOU need glasses, not your hubby. Plus, you have a dazzling aura . . . .